Monteverde is one of the top destinations and most popular destinations in Costa Rica and for good reason. There are tons of things to do in Monteverde and it is known for its diverse wildlife and tepid climate. Getting to Monteverde on your own is usually a cause for concern and for good reason. You are driving on a small dirt road and up a mountain! But honestly, I drove it with a standard car and while it was slow going it wasn’t too bad. My Experience: This is the route that I took and is definitely the most common. From highway 1 you will take the 606 (Do not take 605 or 145). When I drove the 606 I found it to be an easy if not slow drive. I drove it with a standard car (in dry season) and had no difficulty. The dirt road is maintained very well and not very steep. It is windy and wraps around the mountain so drive cautiously. Route 606 in Costa Rica is 36 km total. The first 20 km is completely paved and gains elevation quickly. The views are fantastic, but remember to pay close attention to the thin road. The last 20 km is dirt road and (usually) well maintained. If you are driving during dry season I wouldn’t be too worried to drive this with a standard car. If it is wet season a 4x4 with 4 wheel drive is necessary. Don’t drive this road at night – there are no guard rails and no lights! My Experience: I drove this road as I was leaving Monteverde and found it to be another long but easy dirt road to follow. The road is well maintained and I had no difficulty with my standard rental car. Route 142 is paved and wraps around Lake Arenal. The road is hilly and a one lane road. Often times you will get stuck behind large slow moving trucks. It is frustrating but wait for a good spot to pass – I saw way too many accidents on this road. Note that there are only 2 gas stations along this road; one in Nuevo Arenal and one in Tilaran. Don’t let your gas get too low. Once you leave Tilaran you will begin on route 145. It is paved road for about 10 km after Tilaran then turns to dirt. You will hit a fork in the road – be sure to go right! It will be dirt road the rest of the way to Monteverde. Once it turns to dirt you are about 1.5 hours away from Monteverde. Overall I found that the dirt road was very well maintained and I had no trouble on it. Do remember that I drove in the dry season. A great place to stop along the way are the Viento Fresco Waterfalls. You will see signs but know if you are coming from Tilaran, once you hit the dirt road it is about 3 km away. 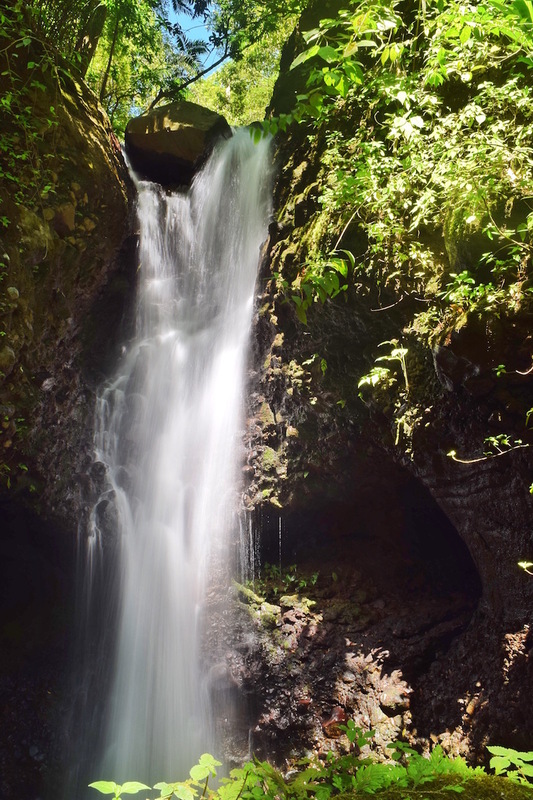 The Viento Fresco Waterfalls are also a great road mark if you are heading in the opposite direction and going towards Arenal. The dirt road ends about 3 km after you pass the waterfalls entrance and will remain paved the rest of the way. Once you leave Tilaran there is vary limited food options. I did pass one restaurant that looked nice with a beautiful garden: Restaurant Turine. Although it looked nice I didn't go inside.